The video poker rules are quite easy to understand and simple to follow. Just like the traditional card game of poker which can be found in home games as well as in the casinos, in video poker player also will be dealt five cards randomly. In online casinos, video poker is played in just the same way as it is in a land based casino. However, in video poker, the player would not be competing against any other player but only against the machine. The first thing that the player would have to do is to decide on the bet amount which should be within the minimum bet and the maximum bet range. The cards would then be dealt. In the video poker machines which are located in the land based casinos, the player would have to put in coins in the machine in order to bet. In the online casinos, the player would just have to select the bet amount. For the online casinos, in video poker the player would have to decide which cards to use to make the hand. These can be selected by clicking on the right buttons and then clicking on the Draw or the Deal button. These were the rankings of the hands in video poker. 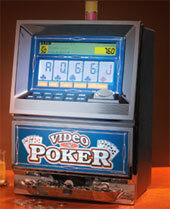 Just like in real poker game, in video poker the basics of the game remain the same. Even the rules of the game remain the same as they are in land based poker. The player would have to ensure that the bet has to be placed according to the minimum and the maximum betting limits and should not exceed these limits. These were some of the basic rules of video poker. One thing to note is that in video poker there are not as many rules as there are in the traditional poker games. There are fewer things to keep in mind since video poker is basically a form of RNG slot machine and is meant to be an easy and entertaining game. Some additional things that you would need to consider while playing video poker is that you should check which machines would provide you the highest payback percentage. A video poker machine which has a higher payback percentage would give you a better edge in the long term. Understand the machine you are playing on, study the payback charts, the minimum and maximum betting limits and only select a machine where you are comfortable with these betting limits.